Today, many Christians, concerned and challenged by contemporary trends in society and religion, are bewildered and perhaps tempted to leave the Church and manage on their own. Courage and Conviction is addressed to discerning adult Christians who seek something between high theology and pious platitudes. Ranging from consideration of Christian identity, via the challenge of faith-filled living in a world of diversity, to suggestions for mature discipleship today, these reflections—building on Scripture studies, cultural anthropology, and life experience—are offered by way of support, encouragement, and perhaps further enlightenment. Anthony J. Gittins is an ordained member of the Spiritan missionary Congregation who served for a decade in Sierra Leone, West Africa. Trained in social anthropology, he subsequently taught theology and anthropology for thirty years in London and Chicago. He also worked with and among homeless women and as a hospital chaplain. Currently emeritus professor of theology and culture (Catholic Theological Union, Chicago), he offers workshops, seminars, and retreats nationally and internationally. He has written books on culture and theology, mission, spirituality, and discipleship. "This book is the fruit of years of deep reflection on what it means to be a Christian in today's world. Savor the wisdom, faith, and practical insights that fill every page. This is a book that should be underlined, used for prayer, and shared with others." "The urgency of this writing is not in the offering of new ideas for growing into our Christian call but in living out that call—courageously, collectively, and faithfully—in the world in urgent need of hope, healing, reconciliation, and Good News. Courage is needed to see beyond comfortably held understandings and to risk falling into the full embrace of the deeper truth and beauty of Christian discipleship. Conviction is not presented here in the tone of insistence but as participation in—and cooperation with—the Divine gifting of creative imagination and Jesus' model of discipleship. The urgency is at hand; so also is the mission `where we are, not somewhere else,' for compassionate and inclusive encounter, upholding the dignity of diversity, loving the least among us, intercultural and countercultural witness, giving hope, and living `holy madness.' In this book, Fr. Anthony honors Christian adults in this mission to be the vision and presence of Jesus in the world." "Who is a Christian (identity)? How is Christian commitment related to Christian mission (life at the margins)? How is Christian mission realized today (discipleship)? Only a theologian and anthropologist as learned and wise as Anthony Gittins can help us answer these three questions with `courage and conviction.' And don't be fooled by the subtitle of the book. Gittins's answers are anything but `unpretentious' because they are deeply rooted in the Bible (each chapter being a challenging meditation on a biblical text!) and born of a lifelong missionary practice at the margins of society. Pick up the book and read and your life will not be the same." "In the wake of the latest reports on abuse scandals and the subsequent critique of systemic clericalism, Courage and Conviction is a useful guide for theologically-educated and/or ministerially-active Catholics struggling with both ecclesial and personal spiritual malaise. As a meditative reflection, it will help reignite creative passion in steadfast yet worn-out Catholic-Christians yearning to recommit themselves to discipleship rooting in Jesus's mercy and love." "Courage and Conviction is by far one of the best books from Anthony Gittins. It speaks clearly and directly to an intergenerational audience of Christians who are seeking to embrace and renew commitments to following Jesus with hearts on fire and eyes wide open." 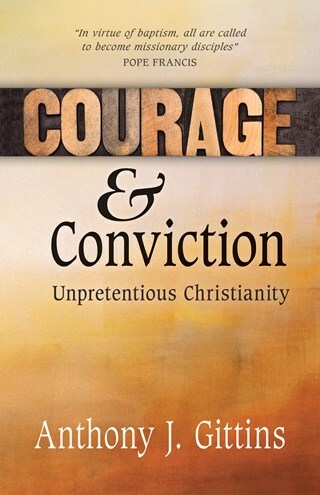 "Courage and Conviction: Unpretentious Christianity is a must-read for those who long to deepen the living of their faith in the contemporary global and ecclesial realities. Once again Gittins's experience, wisdom, and insights draw the reader to a depth of reflection on what is asked of us if we are to be intentional about responding to the call to discipleship. The seamless integration of Scripture in each chapter challenges readers to ponder how they are being called to live their baptismal commitment and be the presence of love in a world where so many hunger and thirst for justice. Honestly facing the questions posed throughout the book while making one uncomfortable can move one from complacency to commitment to ongoing discernment of the Spirit's invitation and action." "Delighting in the joy of revelation, so much more life-giving than mere `religion,' Gittins is a helpful companion no matter what road you have taken. Precisely because he knows he has not yet discovered all there is to know and love, Gittins can help you find even initial answers to the questions that won't go away."